Swiss police arrested one of the pro-Brotherhood and Qatar regime supporters on Wednesday who attempted to attack Qatari and other Arab activists who were organizing a silent protest in Geneva outside the offices of the UNHCR to denounce terrorism and Doha's repressive practices against Al-Ghufran tribe. The Al-Ghufran tribe, with the participation of a number of Egyptian, Yemeni, and Syrian activists were organizing a permitted silent protest in front of the Palais des Nations in Geneva against both human rights abuses, denaturalization and forced displacement policies by the Doha government as well as Qatari support for terrorism in Syria, Libya, Iraq, and Egypt. The protest was organized by the Ecumenical Alliance for Human Rights and Development and the Dialogue Forum for Development and Human Rights. The Muslim Brotherhood, which is designated as a terrorist organisation in Egypt and a number of Arab countries, reportedly deployed some of its Tunisian, Algerian and Libyan members, in addition to individuals who are reportedly illegally living in Switzerland, to attack the protest. 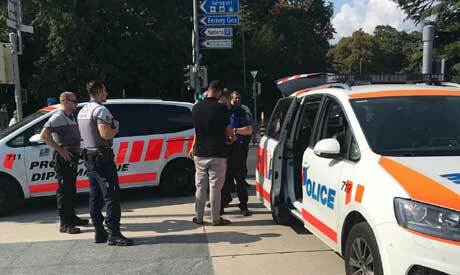 The Swiss police initially buffered the the attackers away from the protesters, but the pro-Qatar individuals returned attemptiing to use violence against the protesters. An investigation has been open by the police into the incident. The arrested Brotherhood follower was arrested stopped by the police after attacking some of Al-Ghufran protesters on their way to a subway station. Many of the pro-Brotherhood elements ran away from the site of the incident to escape arrest. A number of tourists and visitors in the area joined the protest, which angered the Brotherhood individuals who then tried to use force against the protesters, causing fear among some of them. Some of the protesters clashed with the Brotherhood followers in a bid to stop their offensive on the demonstration. Said Abdul Hafez, the president of the Dialogue Forum, condemned the acts of the Brotherhood, saying "the hired thugs of the Brotherhood and Qatar have were used in Geneva to stop any activities that seek to condemn the forced displacement and the denial of the rights of more than 6,000 Qataris of their citizenship, which leaves no doubt that trhe Qatari regime is involved in supporting terrorism." Ayman Nasri, the head of the Ecumenical Alliance, said that the "terrorist Muslim Brotherhood relies on outlaws from different Arab nationalities, who are living illegally in Switzerland to protest on behalf of the movement." Nasri added the Brotherhood wants these elements to conduct "acts of violence against peaceful protesters", with the aim of preventing his organisation from securing permits for peaceful protests in the future. He noted that the case is now in the hands of Swiss authorities in Geneva, explaining that his organisation will follow up on the investigation's developments.